Commercial Plumbing Companies, Plant City, FL | A Step Above Plumbing Inc. Commercial Plumbing Companies, Plant City, FL | A Step Above Plumbing Inc. When you think about commercial plumbing companies in Plant City, we want to be sure that we come to your mind. If you need immediate help with a plumbing problem at your business in Plant City, Florida, you may feel like you don’t have time to shop around looking at different commercial plumbing companies. Every day you have plumbing issues is affecting your business, and it may be making your employees unhappy and affecting their production. Not only that, but plumbing problems can inconvenience your customers and even shut down your operation temporarily. 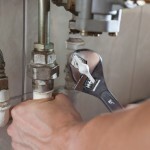 We service all types of plumbing, including toilets, pipes, water heaters, drains and faucets. We can handle large contractor jobs. We are dedicated to doing the job the right way the first time. While this may cost more upfront, it saves your business money in the long run by reducing the amount of time you are closed and preventing the need for repeat repairs. We will show up when we say we will. We have a total of three master licenses within our company. Many other companies only have one. We have extensive knowledge of local codes and regulations. We have been in business for over 10 years. We are open Monday through Friday with early morning hours available. We can schedule appointments for Saturday and Sunday when needed. Not all commercial plumbing companies are the same. For all your commercial plumbing needs in Plant City, give us a call today.